Trends in Cognitive Sciences (2001), 5, 225. (by Joseph P. Levy). The goal of computational cognitive neuroscience is to understand how the brain embodies the mind by using biologically based computational models comprised of networks of neuronlike units. This text, based on a course taught by Randall O'Reilly and Yuko Munakata over the past several years, provides an in-depth introduction to the main ideas in the field. The neural units in the simulations use equations based directly on the ion channels that govern the behavior of real neurons and the neural networks incorporate anatomical and physiological properties of the neocortex. 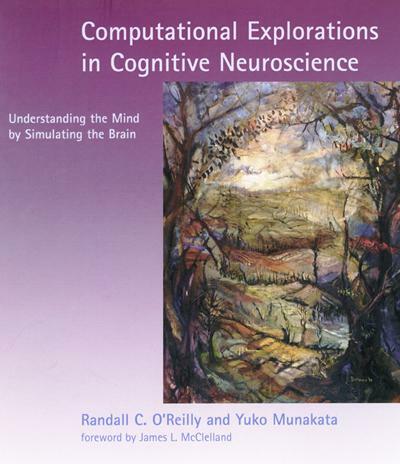 Thus the text provides the student with knowledge of the basic biology of the brain as well as the computational skills needed to simulate large-scale cognitive phenomena. The text consists of two parts. The first part covers basic neural computation mechanisms: individual neurons, neural networks, and learning mechanisms. The second part covers large-scale brain area organization and cognitive phenomena: perception and attention, memory, language, and higher-level cognition. The second part is relatively self-contained and can be used separately for mechanistically-oriented cognitive neuroscience courses. Integrated throughout the text are more than forty different simulation models, many of them full-scale research-grade models, with friendly interfaces and accompanying exercises. The simulation software (PDP++, available for all major platforms) and simulations can be downloaded free of charge from the Web. Exercise solutions are available and the text includes full information on the software. Randall C. O'Reilly and Yuko Munakata are both Associate Professors in Psychology and the Institute for Cognitive Science and Center for Neuroscience at the University of Colorado, Boulder. "A wonderful addition to the literature"
"It is hard to think of a more ambitious--and potentially revolutionary--textbook in the fields of neuroscience, cognitive science, psychology, and natural computation. I read the book with great pleasure and was amazed by the amount of up-to-date exercises." "This is an excellent book. It manages an almost miraculous combination of breadth, depth, and accessibility. The coverage is comprehensive, including all of the major topics of computational cognitive neuroscience. The treatment of each topic is deep enough to convey the essential computational issues relevant to each, and to give interested readers a hands-on acquaintance with those issues." "I felt a growing sense of excitement as I read this book. I believe Computational Explorations in Cognitive Neuroscience will boost interest and unify the focus on describing high-level cognitive processes in terms of biologically relevant models. The writing is tremendously clear and engrossing. A truly important contribution to the field." The painting on the cover is by Joshua Dorman, and is entitled "Yonder Interior." Click here to see more work by Josh. His work is also available on NextMonet.com. Please contact either or for further information.